ISM Raceway in Avondale, Arizona. In recent years, NASCAR’s made sweeping changes to how it crowns champions in its top series—most notably and controversially, deciding titles amongst four drivers at a single track to end the year. 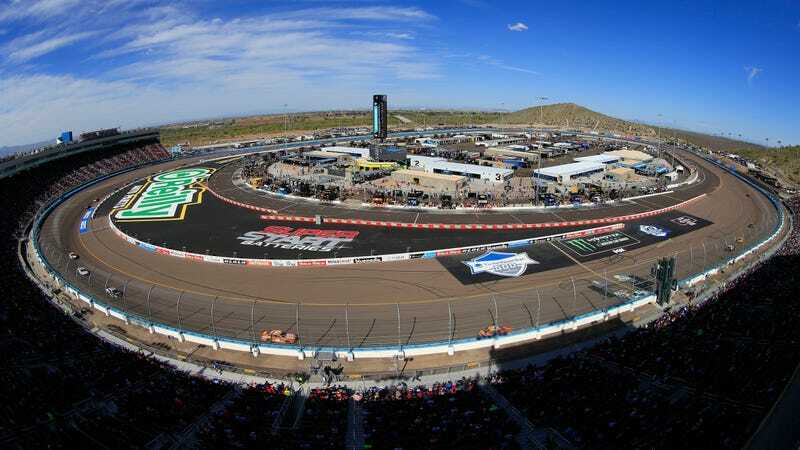 In 2020, that track will go from the 1.5-mile Homestead-Miami Speedway, which has hosted the finale since 2002, to the mile-long ISM Raceway in Arizona. That change, and plenty of others, are part of a partial schedule reorganization for the 2020 Monster Energy NASCAR Cup Series season, announced by NASCAR on Tuesday. Major potential overhauls like venue changes aren’t expected until 2021, when Racer reports that current sanctioning agreements end. But for now, about all NASCAR can do is shuffle the tracks currently has on the schedule—and shuffle it did. The full 2020 schedule is here. In addition to the race that decides it all moving to a completely different type of race track next year, NASCAR announced that the triangular, three-turn Pocono Raceway in Pennsylvania will get a doubleheader, Darlington Raceway will open the playoffs, and eternal crapshoot race that is Daytona International Speedway will end the regular season. That last part means anyone on the bubble to make the playoffs heading into the wreck fest that is Daytona should get comfortable with the idea of selling their soul for a spot in the postseason, because talent alone won’t guarantee it. But more importantly than that, the new schedule highlights part of NASCAR’s new playoff system that’s hard to accept, and probably always will be. The playoffs, in case that’s a new one for you in of motorsports, are NASCAR’s modern way to award a title. As of 2014 in the Cup Series and later in its other two national series, NASCAR titles are ultimately decided by the outcome one race instead of a stretch of races on different types of tracks. It makes things more exciting and more like the “Game 7” moments NASCAR tries so hard to create, but it also comes with its own share of problems. These days in the Cup Series, 16 drivers qualify for the 10-race playoffs, with four drivers eliminated after each three of the first nine races. The highest finisher of the four drivers left in the final race becomes the champion. If a playoff driver wrecks in the final race and the others don’t, that’s too bad. It’s a concept that’s still hard to buy into, for a lot of reasons—one of which being that the dominant drivers of the year don’t always win like they probably should have, and one of which is highlighted by NASCAR changing its venue. Having one race decide the champion in NASCAR’s three national touring series, in addition to being questionable simply because racing is a sport where a fluke of a mechanical failure can doom a driver’s race, is puzzling. Motorsports aren’t like ball sports, where fields are about as constant as regulations can make them from venue to venue. Weather and other things can play a factor, of course, but the yardage and shape of a football field don’t change each game—inherently benefitting athletes and teams who are better on that kind of layout. Moving from a 1.5-mile track in Florida, where certain cars and drivers have an advantage, to a one-mile track 2,400 miles away where that’s also the case, highlights how the current format can benefit certain contenders over others. Sure, the four drivers remaining in contention for one of NASCAR’s national titles at the end of every season should be able to overcome any disadvantage that the layout or location of a race track can present. Otherwise, they probably shouldn’t be in contention for it. But it’s also hard not to feel like it all happens too quickly when NASCAR decides its national champions, even if the race leading up to that moment decision was exciting—just like NASCAR intended.